Don’t worry about your child while they’re at daycare. At Kidstown Learning Center in Lake Worth, we know how hard it can be to leave your child at daycare. When you choose our infant child care, you can rest assured knowing that your child is in great hands. Our infant care room has individual cribs for naptime and toys to help stimulate each infant developmentally. Our professional and attentive caregivers give your child one-on-one play time in a calm and cozy environment, cultivating a safe space where they can learn and grow. If you want to see our daycare center for yourself, give us a call to schedule a tour and learn more about our infant child care at Kidstown Learning Center! • A daily report about your child’s daily activities (including nap time, what they ate, how much they drank, and a schedule of their diaper changes). • A loving and caring environment that stimulates your infant and aids with their development. • A separate crib to maximize their nap time and let them nap on their own. • Staff members who are certified in First Aid and CPR. • An infant menu so you can know what food options we have available for your infant. • Care for any special needs your child has — just let us know what we can do to help! 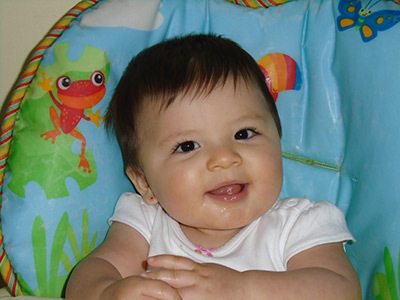 Kidstown Learning Center offers a safe, comfortable, and affordable infant child care for when you just can’t be there. At our infant child care center in Lake Worth, your infant is provided with excellent tender loving care in a warm, clean and safe environment. Our infant caregivers are thoroughly screened and carefully selected, and all of our professionals are also certified in First Aid and CPR. The infants we care for are held, cuddled and rocked, and each baby will have their own crib for sleeping purposes only and to nap at their own time. Your infant will thrive in the loving, stimulating and responsive care they receive in our homelike atmosphere with face-time and one on one play with their infant caregiver. Our caregivers send home a daily report that includes naps, eating, drinking, and diaper changing throughout the day. They are always open to cater to any special care your baby needs. The infant playroom in our child care center is filled with toys and manipulatives to stimulate and entertain your baby. Our infant care room offers a cozy and comfortable environment with natural illumination coming through the windows and air always flowing through the room. You are welcome to come and visit our daycare center, meet our infant caregivers and let your baby interact with other babies. Our Lake Worth daycare center is open for visits from 6:30 a.m. to 6 p.m., Monday through Friday. We are proud to offer specialized infant child care and serve the families in the areas of Lake Worth, Boynton Beach, Green Acres, and Wellington. Want To Talk More About Infant Care?